SCROLL TO THE BOTTOM TO READ THE LATEST ADVENTURE! Welcome to the newest addition of my blog. I realized that as I travel this great country of ours, I have an opportunity to share the people and places I experience along the journey. Here, you’ll get to meet the people I meet, see the landscapes I am blessed to experience and of course, learn how Teddy got there in the first place. 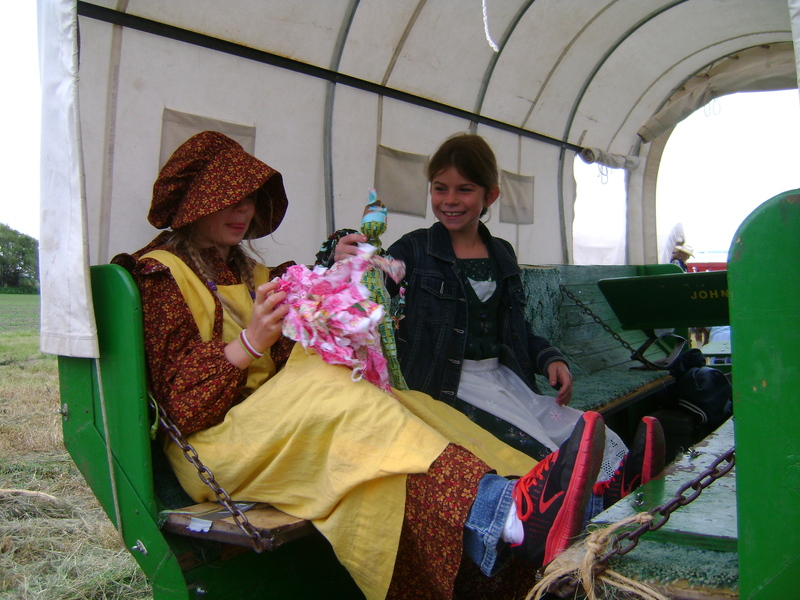 So stay tuned because next week we will be on our way to a wagon train in North Dakota filled with people who craved and get to experience a pioneer adventure! 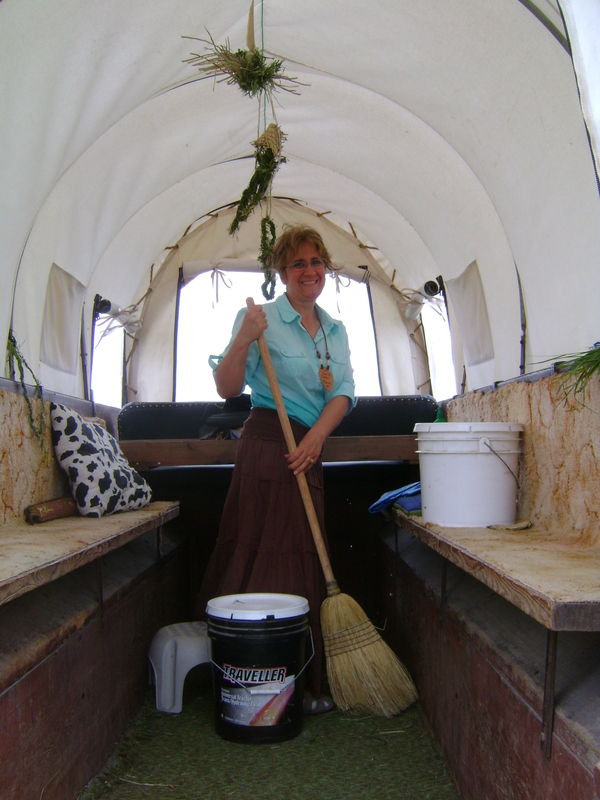 What if you could experience what it must have felt like to be a pioneer traveling across the Midwest in covered wagon? You can! 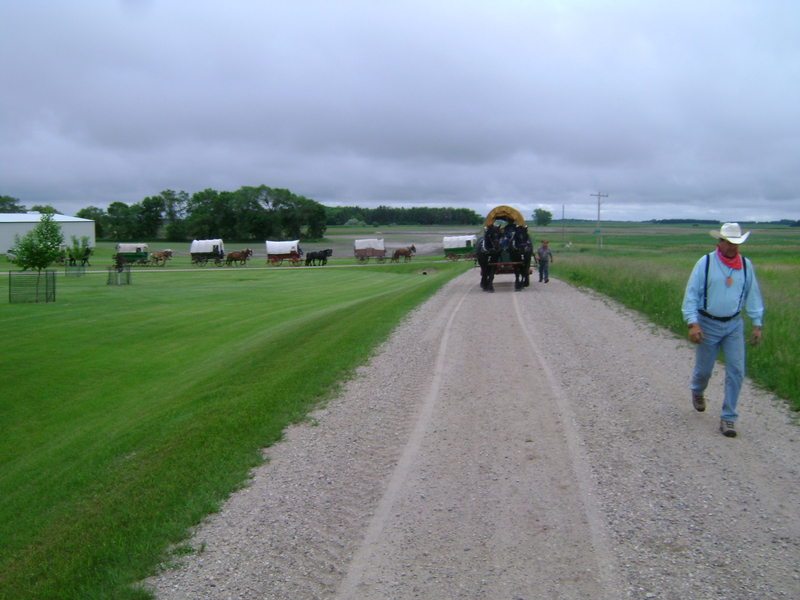 Every year since 1969, a wagon train has left Fort Seward just outside of Jamestown, North Dakota for a week-long adventure for those wanting to experience an authentic American story. I was fortunate enough to be asked to present at a mid-week lunch break for 140 “pioneer families” on this year’s trail. The morning started with the dinner bell calling us to a very delightful breakfast of homemade French Toast with warm syrup, an incredible locally made sausage, fresh coffee or hot cocoa for the kids and all the oatmeal we could eat – in fact I was warned that no one ever goes hungry. After our meal, it was time to strike our tents and start across the prairie. I jumped from wagon to wagon as we moved along at two horsepower, meeting school teachers from Maryland, Librarians from Washington DC, families from Utah, Wisconsin, Florida, The Carolinas, Canada. There was even a family that came from the hustle and bustle of Los Angeles! They all said the same thing – they were there for the adventure. What surprised me most was that for many, this was not their first time. Along the way, we shared stories of adventure and how we thought the pioneers must have felt as they crossed the plains for a better life. Soon, we were by a grassy flat land near a river, in a shallow gully where the wagons were circled and lunch started. 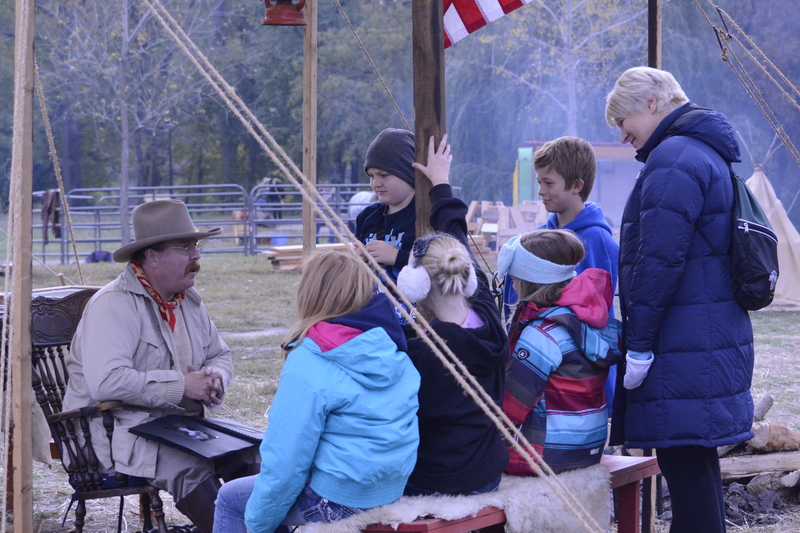 After lunch, they learned about Theodore Roosevelt’s time in the Dakota Territory and of course his many adventures while there, along with many others after. I can’t say enough positive things about this experience. The families I met admitted they had become closer from the experience, as they worked and played together. Many were making life-long friends and almost all said they hoped to do it again. 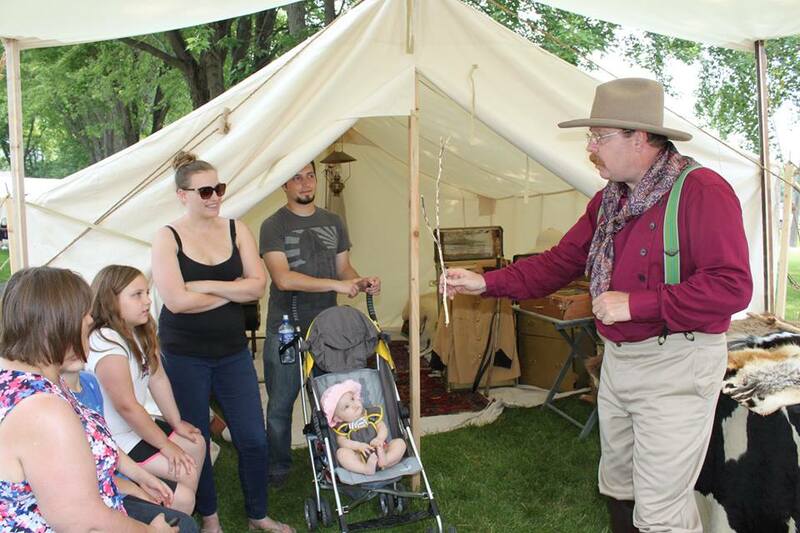 The Fort Seward Wagon train is a non-profit organization that creates an incredibly affordable pioneer adventure that I encourage you to experience. The cost is very low and worth every penny. So seize the moment! Reserve your space for 2015! At the turn of the last century, small towns across America hosted Chautauqua’s. 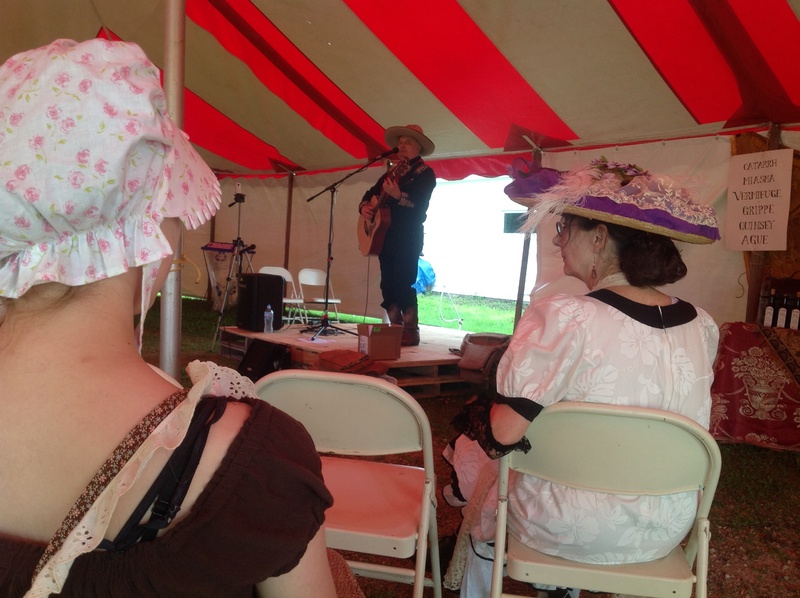 This lecture, music, poetry and political viewpoint presentations under a tent series brought culture and education to rural communities. 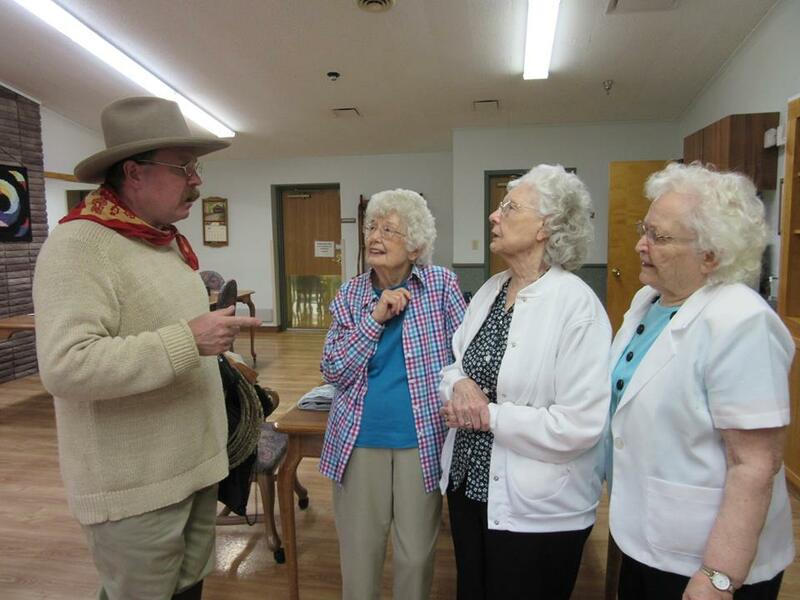 I was asked to present at Rapidan Minnesota’s annual Chautauqua and had a Bully time. Along with Roosevelt sharing the virtues of a “strenuous life” , there was a woman speaking on patent medicines that cure all, lectures on modern farming and musicians galore. 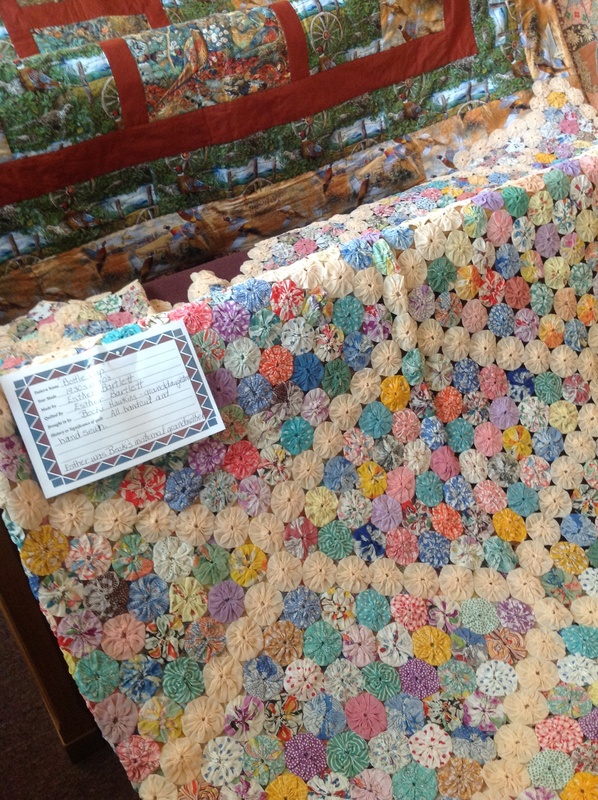 Around the tents were painters, weavers, spinners and of course the classic quilts from across the county. With Parades and events, the 4th of July is a very busy day! I was fortunate enough to be asked to entertain at a friends house and then at the Excelsior 4th of July extravaganza and then a meet and greet with the sponsors of the air show and fireworks. It was a Bully day celebrating all that is special about this great land! 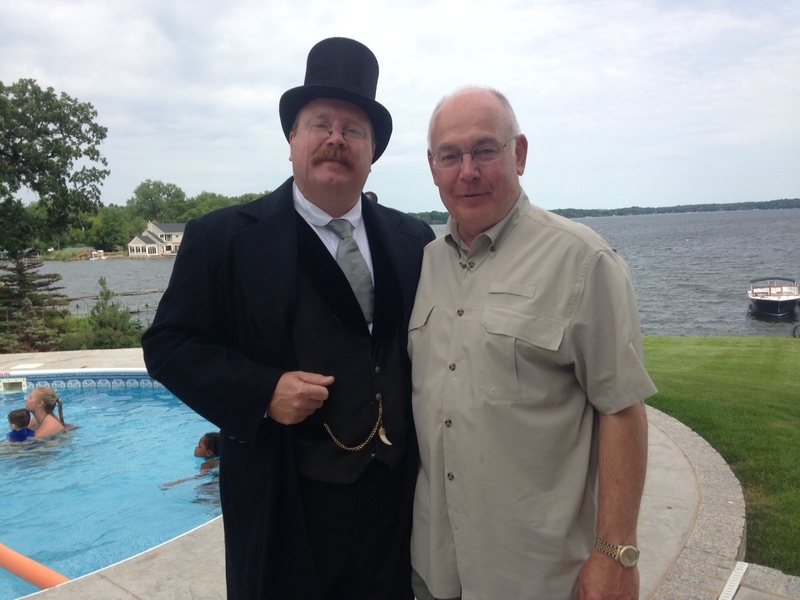 A historical character meets a historical place, Lake City Minnesota. I was invited to speak at the Lake City Kiwanis Club yesterday and take in the beautiful view of Lake Pepin, a wide spot in the Mississippi river that happens to be the place that waterskiing was invented in the summer of 1922! 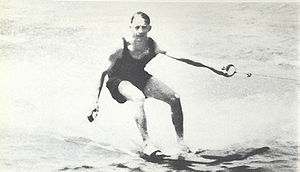 That’s Ralph Samuelson and he strapped a couple of pine boards to his feet and made history. Lake City is only about an hour south and east of the Twin Cities but is a world away when you visit. 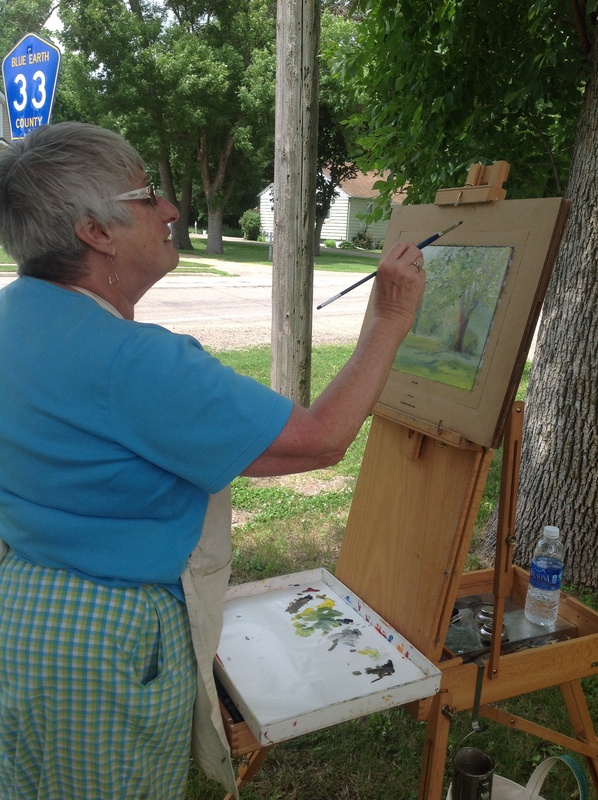 It is one of my favorite places in the state, and taking the 60 mile circle tour around it will send you into Wisconsin and Minnesota, into small artist towns, quaint villages with ice cream shops and homemade pies. Along the way you will see vineyards on hillsides and a handful of wineries just waiting for you to visit. Lake Pepin is worth any visit to Minnesota, so if you get a chance, visit! Litchfield is only 60 miles west of the Twin Cities but that short drive takes you into a beautiful lake country of Minnesota that is stunning. I was part of the Watercade Day’s Parade, where I pitted neighbor against neighbor in a “Bully!” contest. The weather was incredible, the sun sneaking out after a full day of rain just hours before the parade. The almighty decided this is a parade that must go on! I wish I would have had more time to visit the town and meet people, but a parade is something that just passes by. Sometimes life is like that. I have been in many parades as TR, but this one was very special. 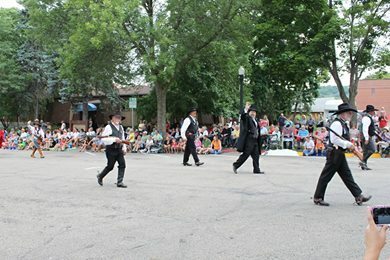 The Big Top Parade is presented by the Circus World Museum in Baraboo, Wisconsin and is held each summer in conjunction with a recreation of the Buffalo Bill’s Wild West at the Museum. This parade features real antique circus wagons pulled by draft horses with period bands playing on the top – or whatever the wagon might hold. Want to see real elephants? A giraffe? A white tiger? – you will at this parade, and so much more. This is the training ground for some of the worlds best clowns, and they are on the street performing while they walk. I can honestly say that this is a “bucket list” worthy event. Take the time schedule this parade in your calendar – you will be glad you did. 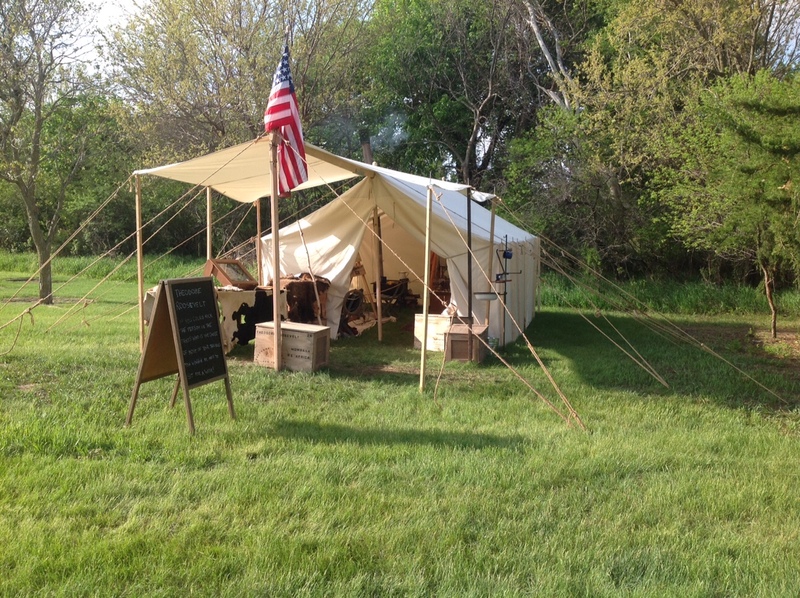 I had never set up my TR camp at a County Fair before, but I had some talented reenactor friends who asked if I was available and told me about the wonderful hospitality of the people who ran the fair. The fact that my wife’s mother was born and raised in the town where the fair resides also helped in my decision to give it a whirl. Setting up camp allowed me to get the old cobwebs off my gear and remind myself on how to assemble everything I bring before the busy fall season. When I say “camp” I mean it. I put up my canvas wall tent, assemble my cot and live the life of TR for 3 or more days. Usually, we do so in a setting that has a bit of wilderness and they bus in school kids to us. This one was on a ball field, surrounded with a fence and a score board! With the rustic nature of our camp and thanks to an incredible Native teepee next to me, it wasn’t hard to imagine a more basic life. Even with so many other things going on at the fair, I understand word traveled quickly that “Teddy” was in town. 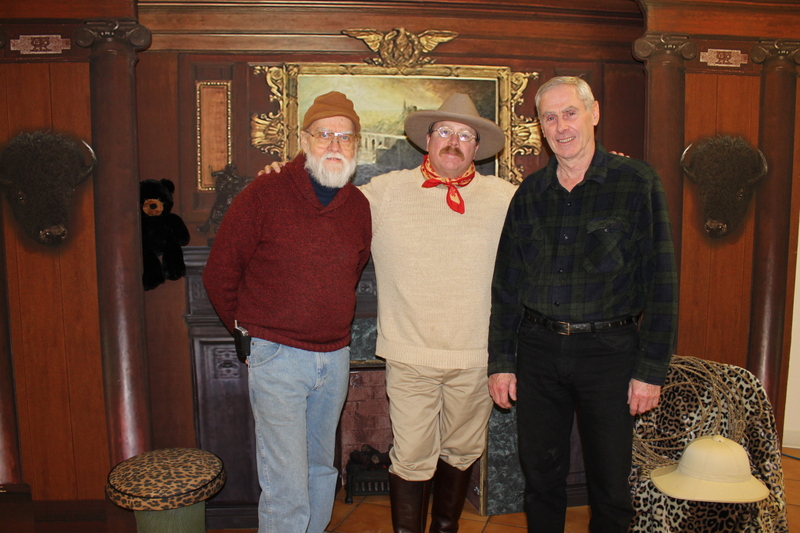 In my camp we talk about all things Roosevelt, from taxidermy – where kids see, touch and learn about animal skins and the their use – to a collection of items and photographs that Roosevelt had during his life events. I had some incredible kids and families stop and visit, many hanging out for well over an hour or more as I shared stories. I want to thank Ethan and his friend for helping me load up after the event, and the LeSueur County Fair board for inviting me! I fly to many events per year and trying to get all of my gear onto a plane so that I don’t have to check baggage is always tricky. Usually, the airlines accommodate me but this time I was told that I was going to have to check bags – no exceptions. The fact that I was speaking that evening to 400 professionals made me more than nervous that I was going to look like a damn fool if I didn’t have anything “Roosevelt” on, but I crossed my fingers, said a few prayers and hoped for the best. The luggage did arrive and my rental car was ready as I left Baltimore for my trip. I spoke at a private event on the Affordable Care Act and Roosevelt’s connection to it, all the while fighting a personal 101 degree temperature. (I knew I felt odd but it wasn’t until I was done with my talk that that figured out why). The audience had great questions and it made me want to go back and learn more about the history of the area I visited. It’s one of the side bonuses of being TR, the fun of touring, seeing the country and enjoying the people I meet. A local magazine is doing a story on my work as TR and they decided a great place to shoot photos would be the Minnesota State Capital, finished during the Roosevelt Presidency in 1905. What none of us realized was almost the entire building was wrapped in scaffolding for major repairs, making taking the photo a tricky thing. We decided to do a few outside shots and then go inside and see what we could find. Now, one thing you need to understand about me is this: When I am dressed as Roosevelt, I am Roosevelt. I am going to work the room and garner as many votes as I can. Even though the building was going through the same kind of renovation’s inside, we managed an invitation to the House Chambers, where I was able to enjoy the amazing acoustics as I recited “The Man in the Arena”. They let me stand at the speaker podium and bang the gavel, giving me a real feel for the power of the position. I have met many intelligent and powerful people in my travels, but when they speak to me as Roosevelt, they are there to listen and engage, rather than negotiate or broker deals. Being on that stand gave me a better understanding of how Roosevelt, when he was a New York State Assemblyman, could want to traverse that kind of chamber and seek a higher role. The Capital will be done in 2016 and I hope I can look forward to speaking to the entire assembly in the future. This was my second year at Big Island where over 6000 children are bussed in to connect with the past. 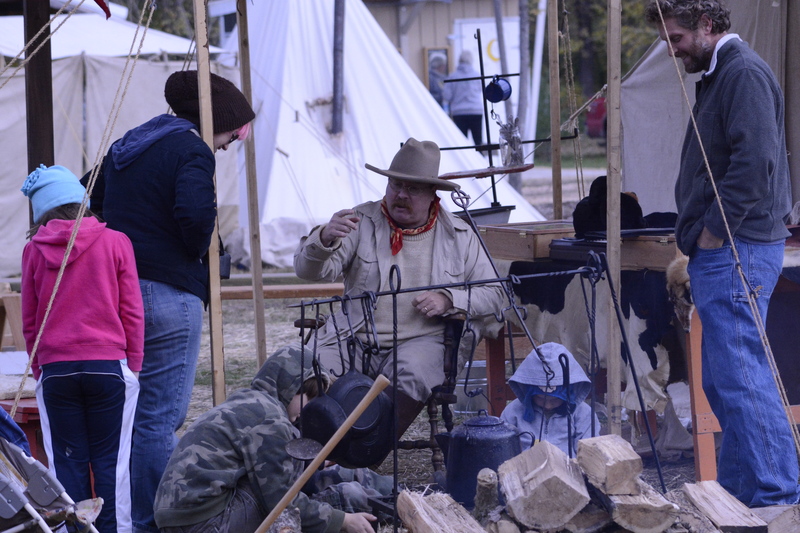 This is true “living history” , as all 400 camps stay in their tents for the entire four days. I had a great time meeting others who do the same, and we shared tips on managing the attention spans of kids who would much rather see a musket fire than listen to a President. I had one little girl who looked at me and then at my roosevelt picture book, then up again, each time her eyes wider. She stepped back slightly, not sure how an old President could be standing in front of her. Finally, she turned to her mother and asked “Is it really Teddy?” Mom nodded yes, and the little girl begged for a photo with me. Once in a while, the magic happens. Jack McGowan is a man with vision, and for the past 19 years, he has been building a history event on his farm for local school children. 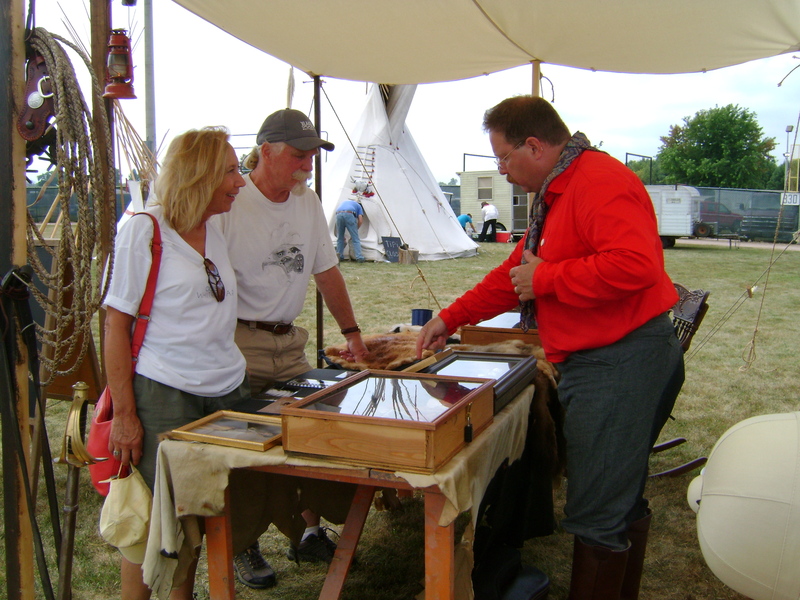 The event has grown now to people coming from six states to learn, experience and enjoy history and fun! 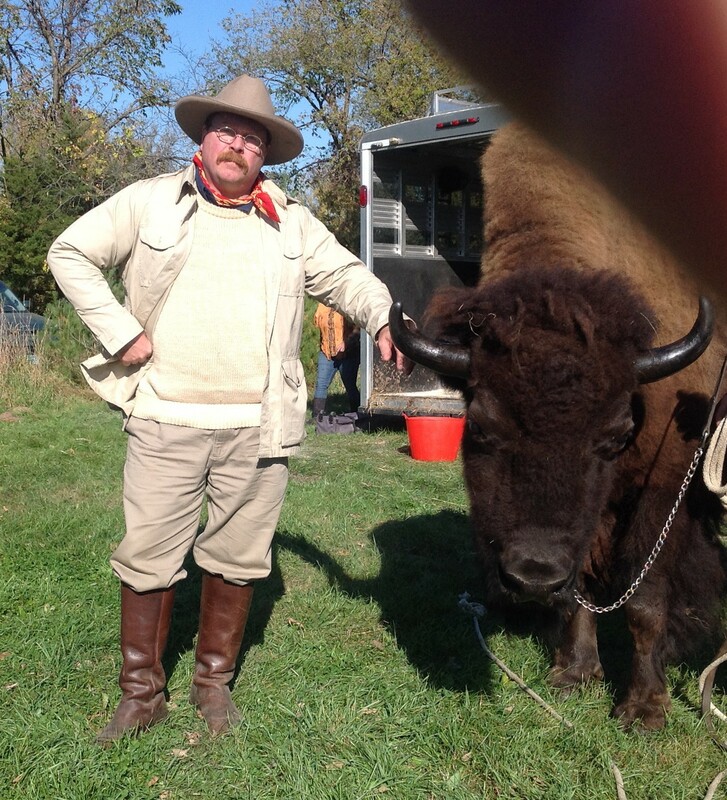 This year had many fun additions, including a chance to meet Cody the Buffalo, one of the few “tame” buffalo in the world. I was also invited by the New Ulm Battery to shoot a real civil war cannon and blow up a 55 gallon drum filled with water! There were over 2000 students and many parents and teachers who filtered through my camp over the four days, many whom I had met before who came back with more questions, or just to hear the stories again. Bully! When the band Director called me and told me they wanted me to be the Master of Ceremonies at a concert as TR, I was thrilled. Music of or about the era, with a spattering of stories about TR, what could be better? Along the way, I also got the crazy idea that perhaps I could sing as well, something I have done for years without a hick-up. Well, both the band and I have been very busy this month and connecting for a rehearsal was all but impossible. Since they are a band, they don’t need words with their music, so I ended up ordering a completely different arrangement in a completely different key. The hope was that we could wing-it at the concert, but one practice run through and it was obvious that they were too high, I was too low and the arrangements too different. I told them I would sit and enjoy the music with the audience. The evening’s format was amazing, the band awesome and the audience engaged. In all a perfect evening of music, stories and at the end an audience who gave a standing ovation. I can’t wait to work with them again! I cannot think of a place that I would rather be on Veteran’s Day that with those brave men and women who faithfully served our nation! In spite of a snow storm that has slowed traffic to a standstill the day before, the room was packed when I shared my own stories of TR and his battle before the battle of San Juan Heights. 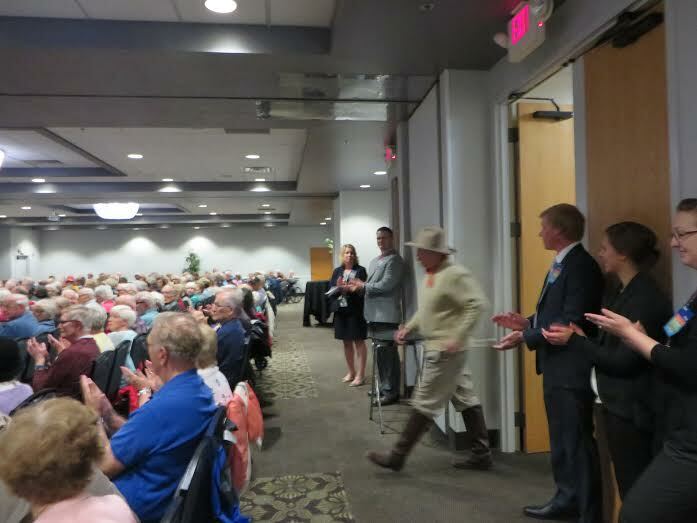 The crowd was great, the venue – an amazing senior center with so many amenities it made my head spin. (One gracious lady told me to sell now and move in so my wife never had to cook again!) 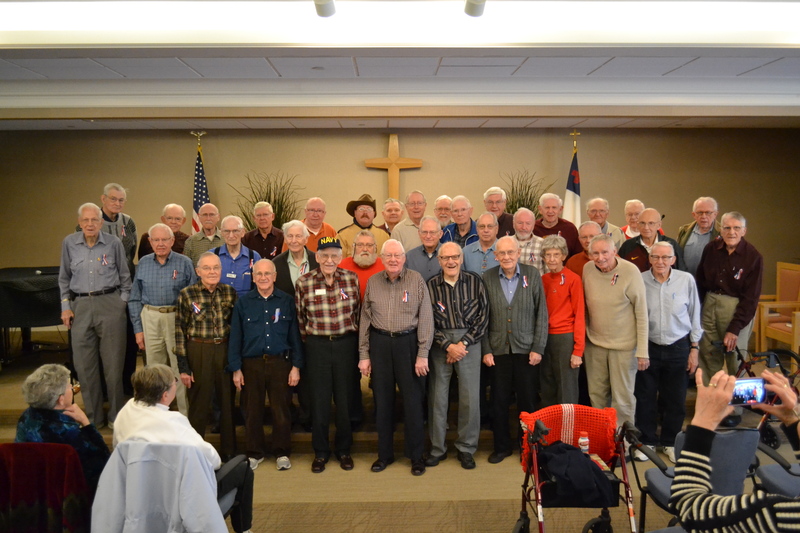 I spent some time learning about several of these fine folks and their service. An added treat was a visit by neighbors in the town I grew up, who happened to be on the mailing list. It was great fun catching up with them as an adult rather than just one of the “kids on the block”. Bully! I had surgery which required me to take some time off from my “Teddy” work at the end of 2014 to recuperate. I was asked to help a group of fine young college men bring in the new year with an inspiring New Years toast and some direction setting for the upcoming year. Bully! We meet people in our lives who end up having enormous impact and mine came a little over a year ago when I was performing at HistoryFest in Mankato, Minnesota. It was my second year at that event, and I was invited to join a group of re-enactors to tour an art exhibit which included a painting that many had posed for the year before at the aforementioned event. I remembered the artist lining up the people and taking the photo, but wasn’t at the time aware of the purpose. We piled into a van and headed to a church where the art had been installed. The artist described the 12 works he had painted of various Saints he was commissioned to paint, with relics from each embedded into the frames. Not only had he painted all of these amazing works, he had also built the matching frames which were by themselves works of art. Over the next year I would run into Jerry at events and realize the immense talent and his graciousness in helping others. I am finalizing a one man play that will premier in Iowa in February and in the process of developing the concepts for the set, I knew that Jerry was the man who could help me put the ideas in my head into a realty. He had asked me to present for his history group and had agreed that having part of the set there would be a nice addition to the talk. The weather in Minnesota is always unpredictable, but winter in the country in southern Minnesota can be brutal. Our evening had -12 degrees with wind chill of -20. It was so bad that they had cancelled school for the day. The normal turnout for their group is about 60, and we set up chairs to accommodate about 30, as we had heard from many that the weather was too dangerous for them to venture out. I had even called earlier in the day to confirm that they still wanted me to come, given the conditions. By our 7 pm start, the room was packed, with chairs at a premium! The audience was great, our talk engaging and fun and the set even better than I had hoped. It was a great evening of history buffs with great questions; kids with a new enthusiasm for our 26th President and a great start to the new year! 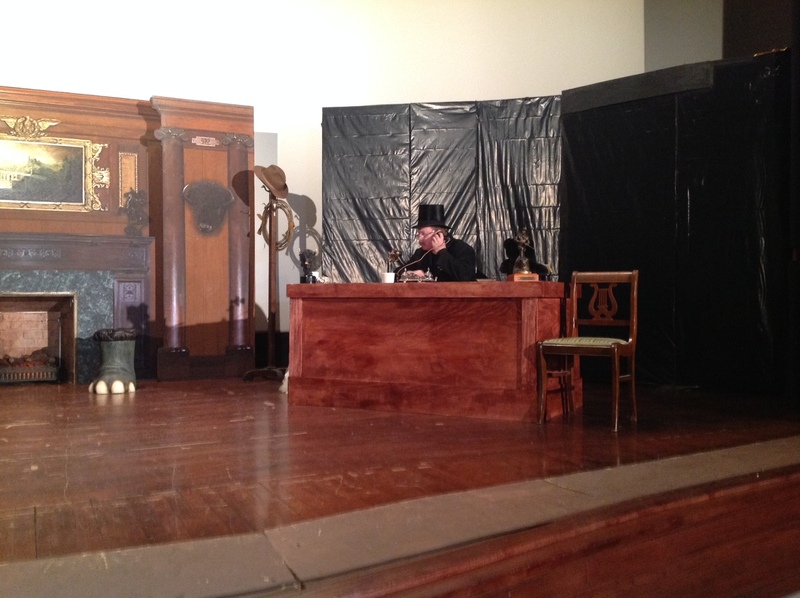 It was great fun launching the new stage show Roosevelt! at the famous Donna Reed Theater. Pat who runs the place is a pure joy and she and her entire volunteer crew made us feel so welcome – and the kids had great questions! 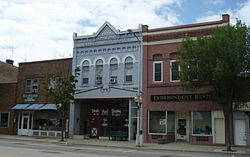 From there, I performed at the Kaleidoscope Factory in Pocahontas, Iowa. It may sound like a theater but it really is a kaleidoscope factory! The Owner, Leonard, brings in acts from all over the country, moves his manufacturing tables out of the way and sets up chairs. He charges just enough to cover his expenses and soon the place is full to the brim with people! Of course, like any small town he is at the mercy of the local sports team going to State or a local funeral affecting his turnout. The question and answer period after was lively, with a local political flavor enhanced with the attendance of a former state senator. Mrs. Roosevelt and I were truly sad to have to leave to get back to Minnesota for a Sunday performance as we enjoyed our short stay. But we will be back soon! Reinvention and adaptation are a common theme in Roosevelt’s life and one we can all learn from. I thought that such a spiritual setting, where contemplation about where we are personally in our given lives and how we fit-in seemed like a excellent venue for such an thought. I was warmly greeted afterward and I enjoyed sharing a brief synopses of “The River of Doubt” while we broke bread. Warm people, conversation and shared insight make for an excellent Sunday morning. Thank-you for the eye opening! I must say that my visit to Albert City was so much fun. I was greeted with a sign into town announcing my arrival and once there, was chauffered around the town. My lunch dining companions were the children at Preschool – who entertained me with their questions to “Mr. Cowboy” and their ability to make animal noises on command. I then presented to over 200 3-6 graders on Roosevelt and then shook hands as I left for the local nursing home and the coveted post lunch speaking opportunity – then back to the school for a 7 pm performance for adults and then post performance sundaes! Iowa hospitality is amazing and the people are genuine and helpful – what a great day! Being “sent off” by the school kids! When the Outdoor expo called, I jumped at the chance to present in Nebraska. 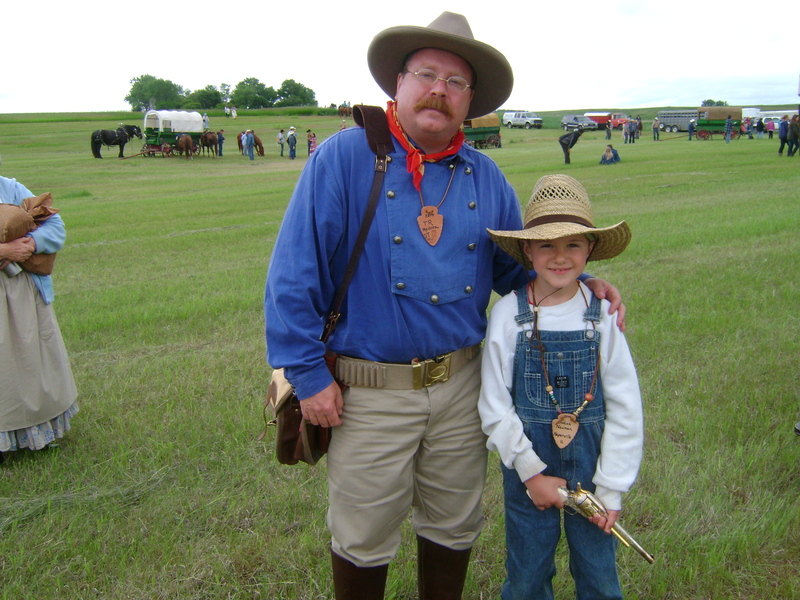 My trips when I competed in living history competitions in Colorado in the past meant I traveled through Nebraska and I fell in love with the land and now after this event, the people. TR Camp is a lot of work to set-up but once erected I always enjoy the chance to present to school children and the public on Roosevelt and hunting, cowboy era living and exposing everyone to a “real” camp. In fact, I think the Nebraska folks were a bit concerned when I rejected the Presidential Suite at the local hotel and chose to stay in camp. Saturday was rainy and cold, and I invited people into my tent to warm up. As soon as they entered my warm, wood heated enclosure, they begged to stay! 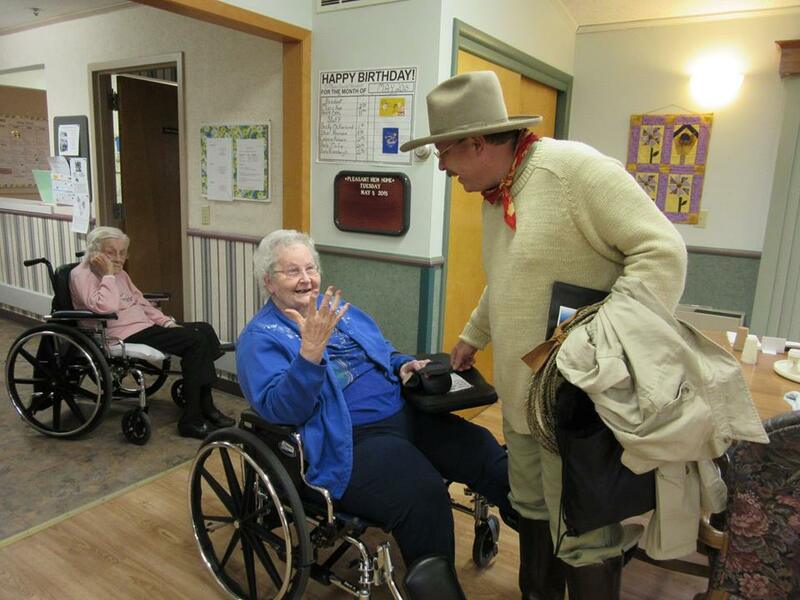 The people from Nebraska are truly wonderful – I can’t wait to go back! Rochester is only an hour from my home and I have many friends there, so I always enjoy having an opportunity to work there. The Think Bank coordinator had been to one of my shows and thought that it was be a great compliment to their Spring programming and booked me for two programs. 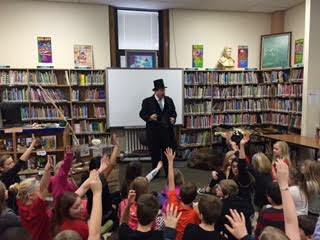 Over 500 customers learned about Theodore Roosevelt and his contributions to the life we all enjoy. 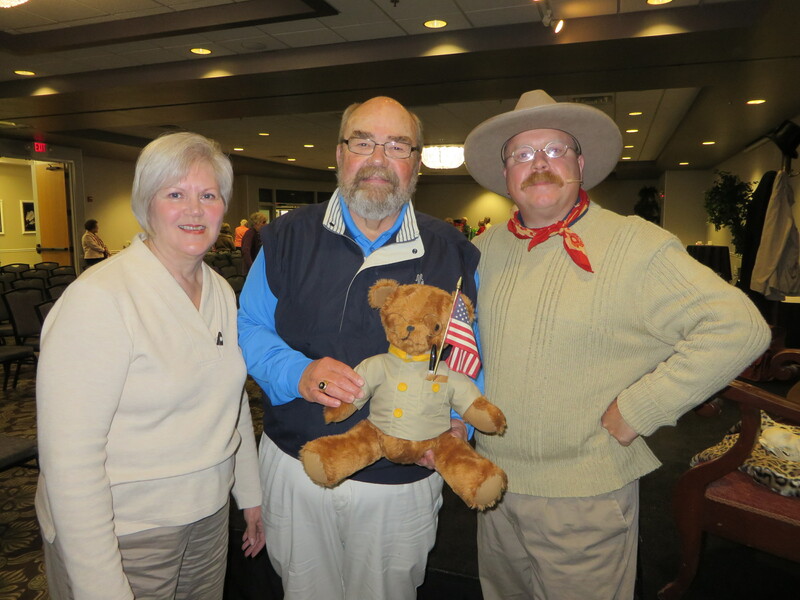 A highlight of the visit was a 31 year old “TR Teddy Bear” that I was asked to sign and date! I love presenting at senior centers! while the crowd was lighter than the 500+ I presented to last week, the questions were great and it was the first time I was asked if there was a DVD they could purchase of me. (Better start buying old copies of “Night at the Museum” to resell). It is good that we have community resources like senior centers where people can connect with each other, learn and grow. Another senior group had me as their “end of season fundraiser” speaker. This included a pot luck that featured every sticky-gooey dessert bar imaginable that used to be made by my grandma. I could have just sat at the table and ate for the entire day and enjoyed watching someone else be “Teddy”, but that’s not my job. So, I instead took the coveted after-lunch speaking job. I kept them from napping and gave them Teddy for the next hour. Bully fun for everyone including me! I have been so busy I have failed to post for over 2 months! Of course, I only post “public” events that I have presented, my corporate and fund-raising for conservation private events are not included in the long list that keep me busy over the year. I am so sorry, I will try to make it up in July! Elysian is in southern Minnesota and I knew the town because it has a “rails to trails” bicycling path that runs right through the middle of town that my wife and I like to ride. What I didn’t realize was that it is also a tourist “cottage” town, because of all the lakes in the area! My consulting artist asked if I would do him a favor and bring TR camp to town for his 4H group and I was not about to say no. 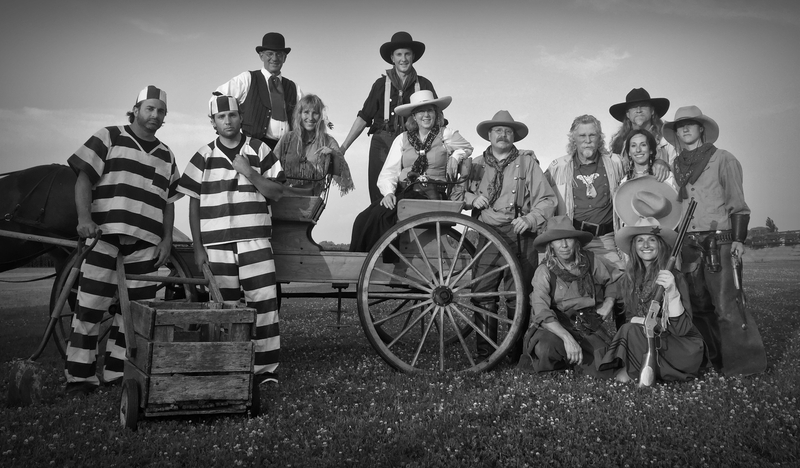 TR camp was in full swing over the 4th of July weekend, my friends at 4H made me the focus of an incredible “History Trail” that included many talents re-enactor friends. Whew, Back to Litchfield for another year and a parade with an amazing crowd and great “characters” partners to teach youngsters about the old west. This parade is especially fun for me as I get to see my son don his old west clothes and spin a rope (Now that he is an adult, this is the only time he ever uses that amazing skill he worked so hard as a kid to perfect) and I get to enjoy my beautiful wife joining me as another history Character. Steele County has such an amazing community support of history that they can actually have an Extravaganza! 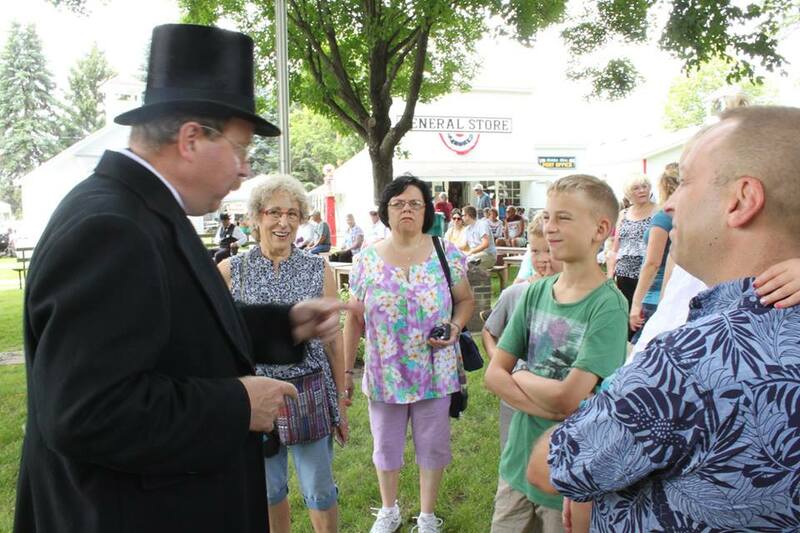 Several hundred people came out on a day that truly felt like 100 degrees to learn about the history of their area. The fact that they had a significant contribution to the foundation of the foster home system in America and Roosevelt was not lost on those in attendance. I can attest now that you have not tested your metal until you have given a speach in 100 degree heat in full wool and a top hat! I had a chance to tell the story of the Teddy Bear to a very shy girl, who was frightened a bit by my bold telling of the great hunt! I was invited to attend the very first gathering of Roosevelt’s in Medora last year but had a scheduling conflict that didn’t allow me to do so. Informed that they planned to do so again, I told them I would not miss it! The Theodore Roosevelt Medora Foundation operates many of the sites and accommodation’s that sit next to the entrance of Theodore Roosevelt National Park. It is one of the most family friendly places on earth, with programs for kids, hiking, animal watching, entertainment and theater shows and a direct connection to history. You MUST take your children or Grandchildren to this amazing place. Roosevelt himself said “I would have never become President if it were not for my time in the Dakota’s. 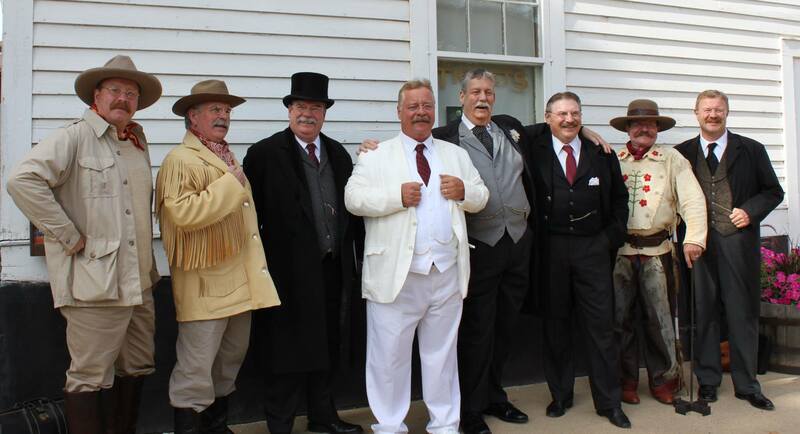 In attendance were talented men who bring Roosevelt to life for audiences across the country. We developed friendships and connections that will last a lifetime. I can’t wait to go next year! I will be traveling incognito as a gentleman by the name of Adam during the month of August, so if you see me on the trail, say hello! My visit was funded in part by Humanities Nebraska and the Nebraska Cultural Endowment, which has been wonderful in bringing me to the State this year to educate so many about the amazing accomplishments of Roosevelt. These programs are wonderful and if you enjoyed my presentation, please provide feedback to them! Once again I have been on the road educating many people (Many of my events are private and not listed on my calendar). 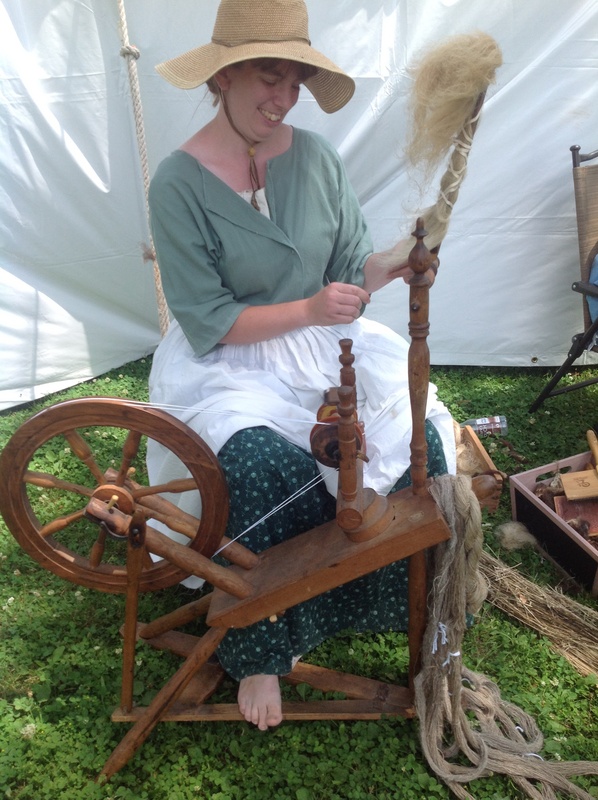 I did attend Historyfest again this year, and this has become a favorite event. You can read about it in the article “Lasting impact” on the home page. If you have never been to Mankato, Minnesota it is worth a trip to understand the plight of the Native American People. This is a very historic town due in most part to the “Sioux Uprising” which resulted in the largest public hanging in American History in the town. Thanks to Abraham Lincoln, the actual number was much smaller than the people of the period wanted, but still a sad amount. 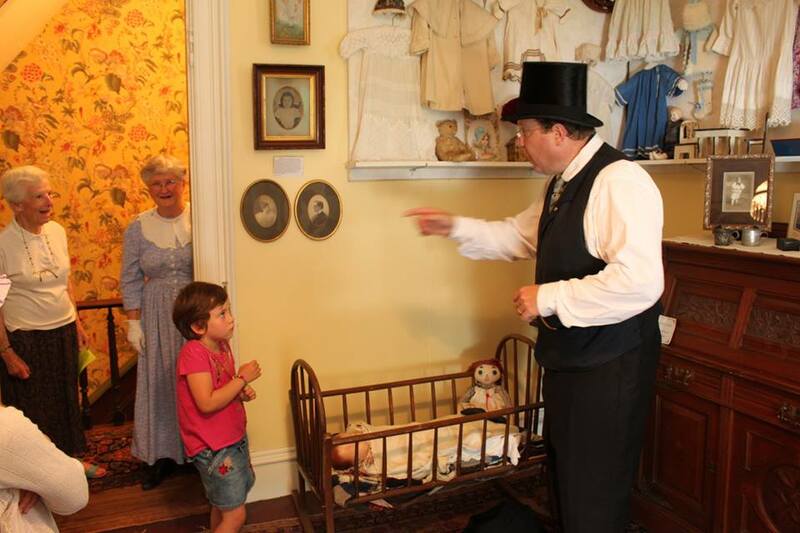 Being in town during Historyfest gives you a chance to visit and see a very different kind of history event, designed for children to have fun and learn history from play. I recommend the event as a family outing because your children will love being there! For the first time in years I had a full month rest and I needed it! My wife was happy to have her husband home for a while and I was just as happy to be able to spend the time to complete some research I had been working on and to write some new programs for the coming year, which is already panning out to be quite busy. It has been a VERY Busy new year and I find that I need to look at my calendar constantly to see where I need to be next! 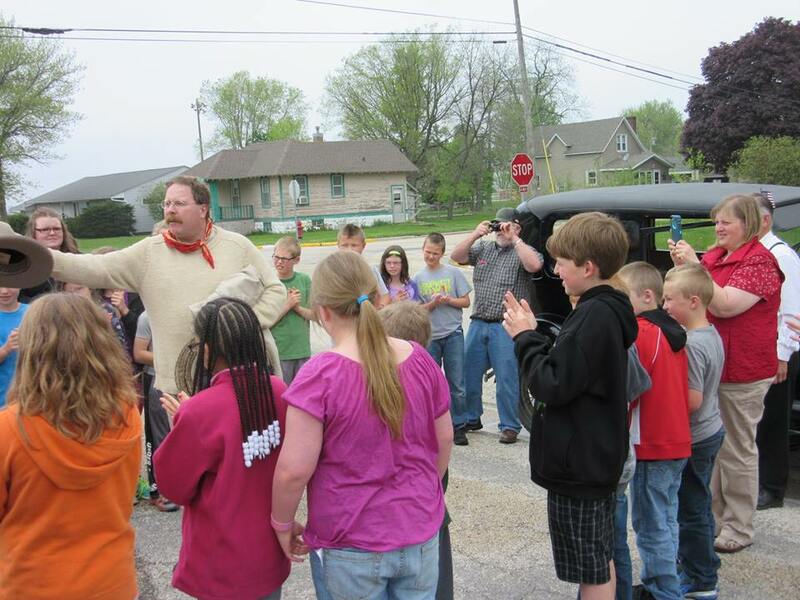 I have had a bully time presenting at nature centers, senior programs, Universities, elementary schools and business events. This past week found me at an Elementary school named after TR in Mankato Minnesota. I started with a kick-off at a general assembly, and then worked with each class individually from kindergarten through 5th grade. Of course, each conversation was age specific, so the little ones learned about life in the White House with a family of 6 and family zoo of 20! As we progressed, so too did the content as they learned more about Roosevelt’s legacy as President and the things they can enjoy today because of his foresight. The local news media did a short clip for the news and the newspaper had me on the front page enjoying lunch with my new friends.